Three weeks ago, I went to the IFPDA/Print Fair in New York City, the largest international art fair focusing on printmaking. This was right after Sandy, and I had no electricity, heat, phone or Internet, but I knew the electricity north of 34th Street was working so I set out. I navigated my way through downed tree and wires. The subway was running uptown, although it was eerie to see so many entry ways cordoned off. When I emerged from the 68th and Lexington station, it felt as though I was entering a time warp. The sun was shining, people were out and the city was humming along at its usual pace — at least north of 34th Street. 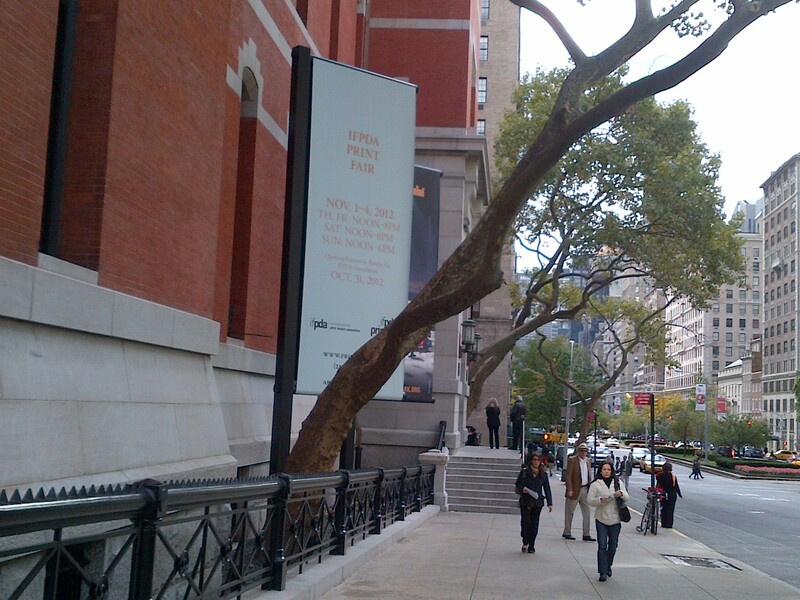 The IFPDA/Print Fair attracts print dealers from the United States and Europe. As a painter and watercolorist, I also produce a series of prints and have worked with one of the finest print dealers to produce my prints so this fair was of particular interest. The discussion this day though was what had happened following the storm. There was talk of the difficulties faced in doing business and troubles with cell phone coverage; but mostly about the damage the storm had done to “art.” Some booths had nothing on the walls. Other booths had just a couple of items gathered together on tables. One dealer apologized for not having any cards to offer (they had been lost to the rising waters in her gallery downtown). Another described the damage done to a neighboring gallery, while another spoke of whole archives being lost. Helpful information was being shared (MoMA has guidelines on their web site for addressing water damage to works of art, which is helpful for both institutions and individuals). I was left with the sense that it was incredible they were able to open at all, and encouraged by the spirit I found there but also that this was just the tip of the iceberg for the damage. We’ve since seen and heard about the damage to many Chelsea galleries — water chest high, gallery storages flooded and records erased. I was fortunate to find a cab to get down to Penn Station. We talked about the storm, driving downtown with no lights and the difficulty in finding gas. 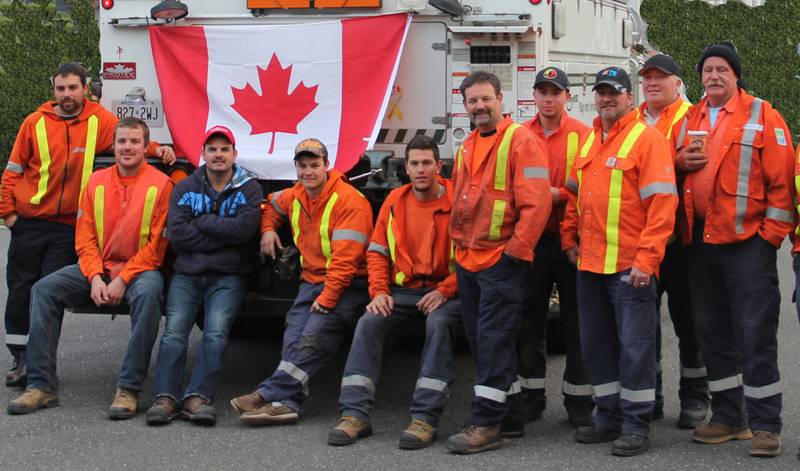 Back home we heard on the radio about the more than 8,000 utility workers coming from out of state and Canada. Given the vast extent of storm damage — hotels without power and those with power filled to overflowing with displaced families — these crews had no lodging. They slept in their trucks, or found a bed in unheated barracks-style tractor trailers provided by LIPA. We were able to take in a crew from Canada. We gathered extra mattresses, found towels, supplied DVDs to watch at night (I don’t know if our loan of the ten-DVD set of the Pittsburgh Penguins Greatest Games qualified as the Canadians favorite team, but most did play ice hockey), the fire house helped with showers, the community baked brownies — we all came together to make the best of a difficult situation. 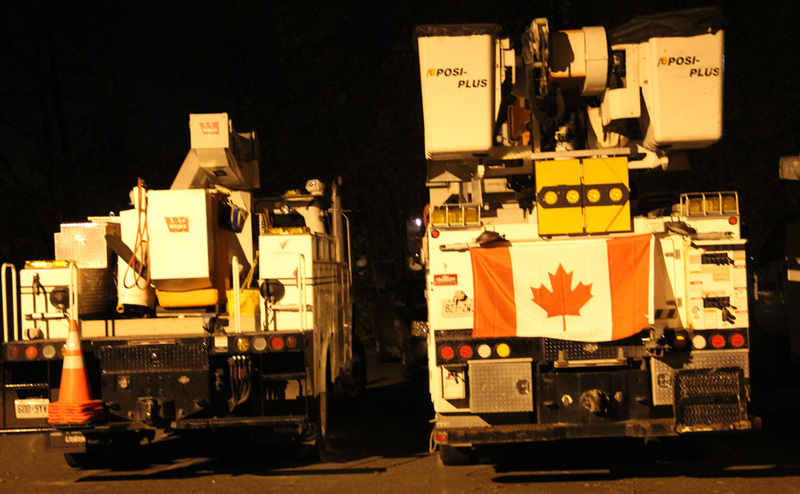 Every night I went to bed with a big Canadian flag lit up on the Canadian utility truck which I could see from my window and every morning they woke me up as they left for work before sunrise. As a friend from an outlying area of New York City told me, when the utility workers drove into his town with their caravan of trucks from South Carolina, it was like seeing the GI’s return from overseas — everyone was so happy to see them. In spite of the long hours they worked, we got to know them a bit — whose child played basketball, where their daughters went to college, the places they had been to for storm recovery assistance. They invited us out to dinner their last night as a thank you. As time went on (two weeks they helped get our community back to normal), we heard of more crews staying in more places around us — the Boys and Girls Club, some schools, another fire house. In many regards, this is the untold story of how people helped people who came to help people. As with my trip to the IFPDA/Print Fair, I was encouraged by the spirit that came to surface in response to difficult times.